Does your kid ask “why” a gazillion times a day too? Little kids are naturally curious about how the world works and are budding scientists – even if they don't know it! 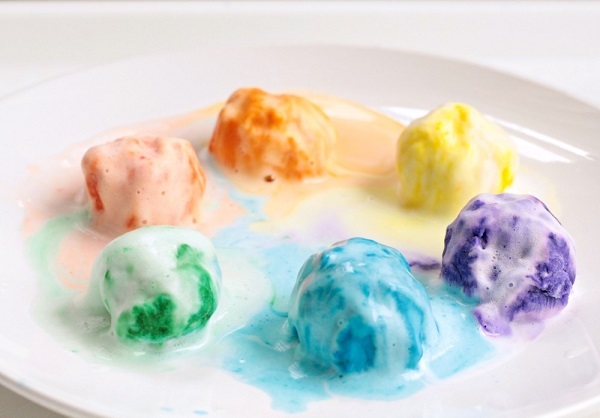 Rainbow-loving kids will adore this simple preschool science experiment where they can melt a rainbow. Introduce young kids to the basics of chemical reactions and a rainbow of color with this fun science activity that also helps build fine motor skills and boost hand muscle strength at the same time. What I love about this science experiment for kids is that it is easy to set up and uses a few simple ingredients found around the house. Don't be surprised if your kids ask to repeat this experiment over and over! This post contains affiliate links. 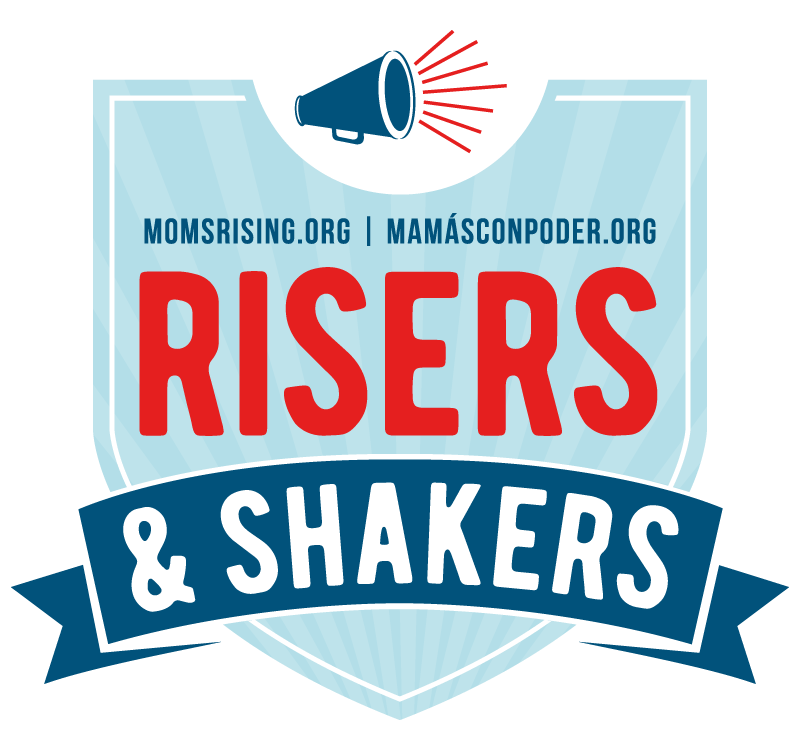 We may earn a commission if you make a purchase through our links at no cost to you. 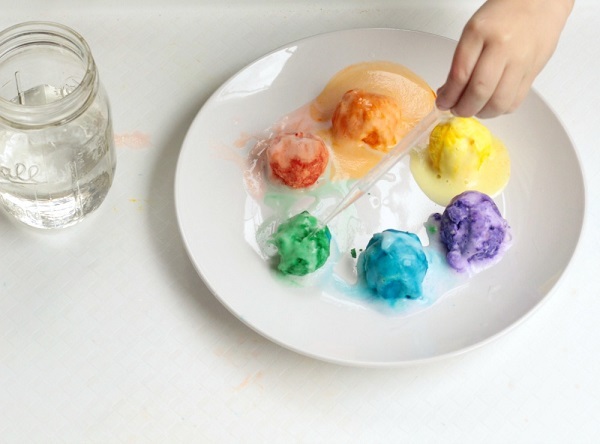 Little ones will love melting a rainbow with a baking soda and vinegar reaction to make a fun, colorful soup they can play in for hours! If you don't have these ingredients on hand, then grab some candy and water to try our science experiment making rainbows with M&Ms. On nice days, I like setting up this science experiment for kids outside. If you concerned about it getting messy inside the house, you can let the kids conduct their experiment in the bathtub. Pour a tablespoon of baking soda into six small containers. 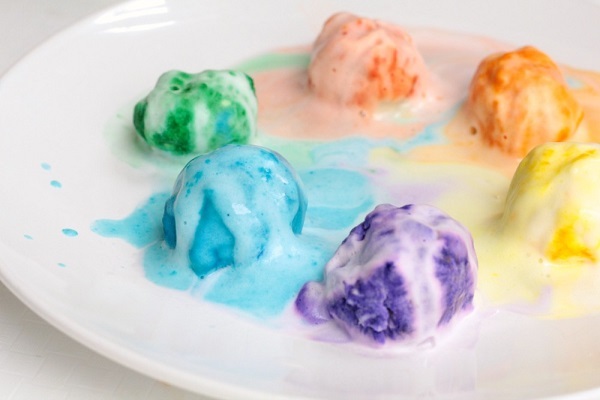 Add a few drops of food coloring to each to make the rainbow. We used red, orange, yellow, green, blue, and purple. Add a squirt of dish soap. Mix with a fork. The dish soap should be wet enough to mold the baking soda into a ball. But if it isn't, add a little bit of water to each container. 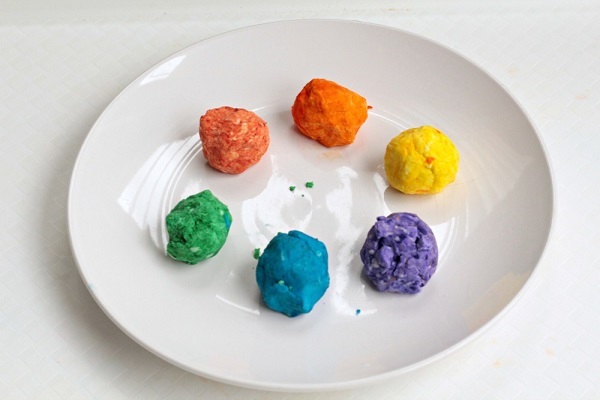 Roll each color of baking soda into a ball and put it on a plate. Give the plate to your preschooler. Ask them what they think will happen when they squirt vinegar on the baking soda balls. Then show them how to use the pipette to pick up vinegar and squeeze it onto the baking soda balls, melting the balls and creating a chemical reaction that bubbles and foams. It can take quite some time to melt all the baking soda, and little ones will love repeating the experiment over and over. Preschoolers never get tired of baking soda and vinegar reacting and the foam produced is pretty and smells great, thanks to the dish soap. After a while, the mixture will get soupy and you can move on from science to sensory play. Though what a perfect way to transition into a color mixing activity! This is a great activity for preschool and kindergarten children. 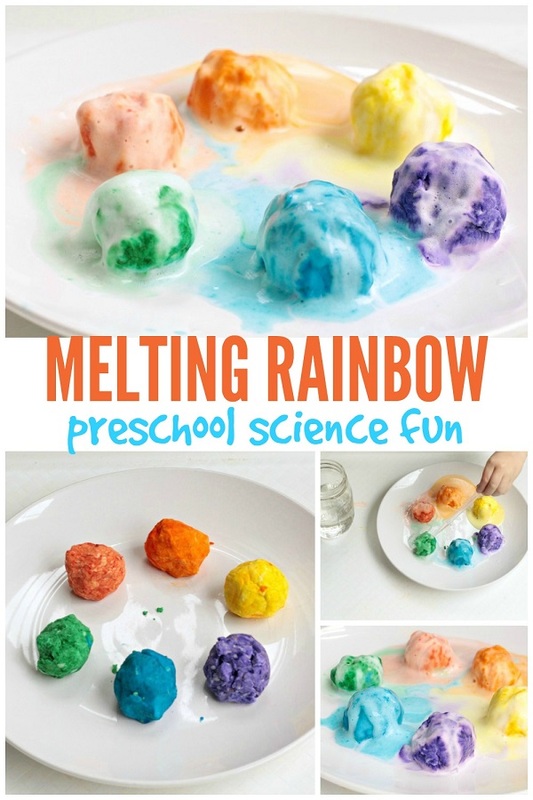 This melting rainbow preschool science experiment is a great way to practice color recognition and introduce kids to chemical reactions. Using the pipette to carefully apply vinegar to the baking soda rainbow is a fun way to practice fine motor skills while learning about science too.